JOIN US FOR AN IRISH EVENING WITH THE WORLD FAMOUS CLYDESDALES! 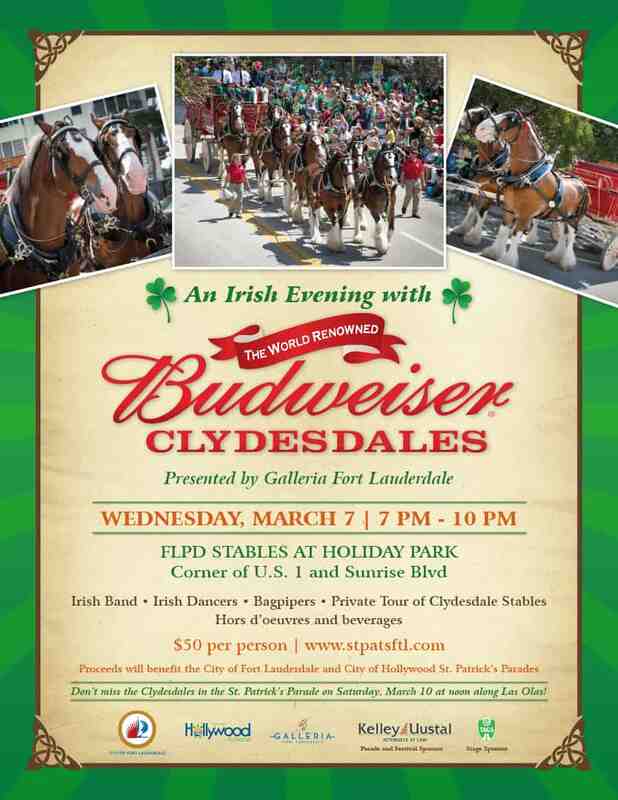 On Wednesday, March 7 from 7 p.m. – 10 p.m., join the City of Fort Lauderdale and the City of Hollywood for “An Irish Evening with the World Famous Clydesdales!” presented by Galleria Fort Lauderdale. This VIP fundraising event will take place at the Fort Lauderdale Police Department Stables, located in Holiday Park at 700 N.E. 9 Street (corner of U.S. 1 and Sunrise Boulevard). Highlights of the evening’s festivities will include a private tour of Clydesdale stables, live performances by an Irish Band, Irish Dancers, Bagpipers, along with complimentary hors d’oeuvres and beverages. Tickets are $50 per person and may be purchased at the link below. Proceeds will benefit the City of Fort Lauderdale and the City of Hollywood St. Patrick’s Parades.